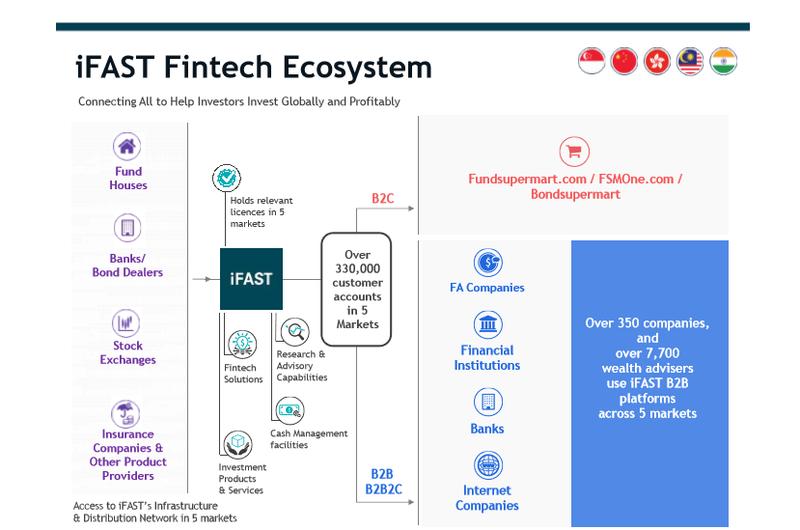 iFAST Corporation is a leading wealth management fintech platform, with assets under administration of approximately S$8.05 billion as at 31 December 2018. Incorporated in the year 2000 in Singapore, iFAST Corp provides a comprehensive range of investment products and services to financial advisory firms, financial institutions, banks, multinational companies, as well as retail and high net worth investors in Asia. The Group offers access to over 9,100 investment products including unit trusts, bonds and Singapore Government Securities, stocks and exchange traded funds, and insurance products; while services offered include online discretionary portfolio management services, research and investment seminars, IT solutions, and investment administration and transaction services. The company is also present in Hong Kong, Malaysia, China and India. At iFAST Corporation, we constantly remind ourselves that our company’s mission is to help investors around the world to invest globally and profitably. Our business strategies and solutions for our partners and clients begin with this mission statement in mind.